Biography and accomplishments or why Khafre was famous: Building the second of the pyramids on the Giza plateau. He ruled Egypt from his capital city based at Memphis which was situated in Lower Egypt (the Nile Delta in the north of Egypt). He was an absolute ruler and incorporated the name of the sun god re, or ra, into his name, Khaf-Ra, means "Appearing like Ra". 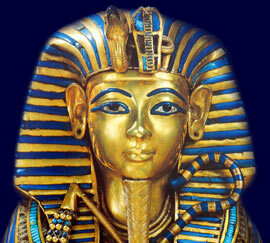 He is known as a harsh and cruel monarch as was his father Khufu. There is unproven speculation that the head of the Great Sphinx was built in his image. Each section of this Ancient Egyptian website addresses all topics and provides interesting facts and information about the Golden Age of Pharaohs and of Khafre. The Sitemap provides full details of all of the information and facts provided about the fascinating subject of the Ancient Egyptian Kings - their life, family, reign, dynasty, important dates and events and accomplishments.